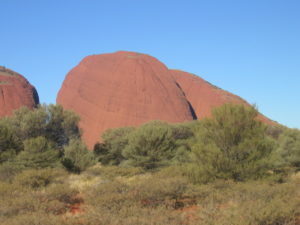 An often understated facet of Uluru-Kata Tjuta National Park when compared with its famous neighbour, The Olgas (modern title) is a set of impressive domes to the west of Ayers Rock. 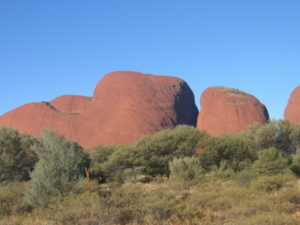 Believed to originate from a similar time as Ayers Rock, they are often included in tours of the park. 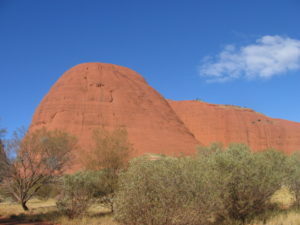 The Olgas are made up of 36 formations, although they are thought to have been one huge piece of rock, much like Ayers, that has weathered over many years. 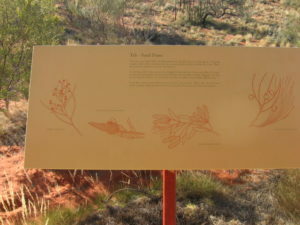 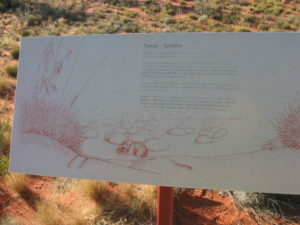 They lay 35kms west of Ayers Rock along Lasseter Highway and have a slightly different make-up to their better-known neighbour. 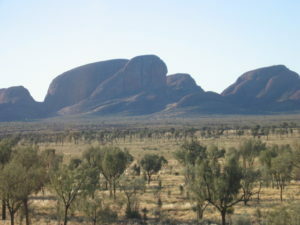 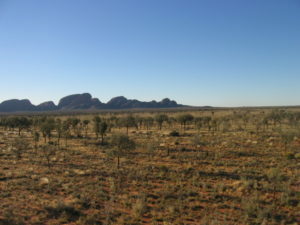 The highest point is Mount Olga, rising to 546m above ground, some 200m higher than Ayers Rock. 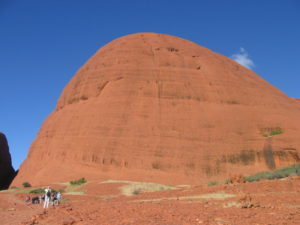 It’s about 22kms around the circumference (Ayers Rock is about 10kms), although visitors can also walk right through the grooves for some stunning vistas and fewer crowds. 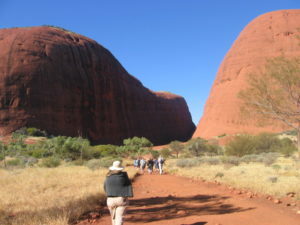 There’s a variety of walks to be enjoyed, stretching from just 600m to over seven kilometres. 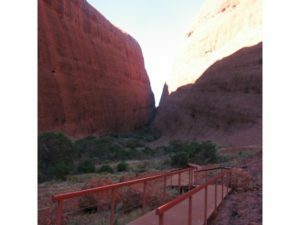 The Walpa Gorge walk, at 2.6 kms, is one of the easiest and most popular. 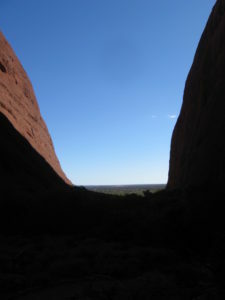 For those that have time however, the Valley of the Winds walk takes in a looped trail and fantastic viewpoints. 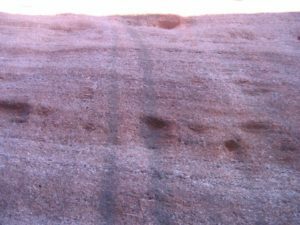 It’s best to do this early as it takes three hours and gets very hot. 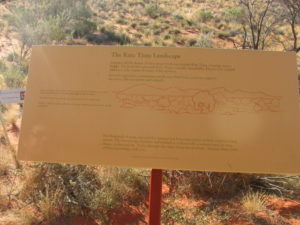 Those that haven’t the legs for it should check out the the Kata Tjuta Dune viewpoint instead; it is not far from the car park and boasts fine vistas of The Olgas. 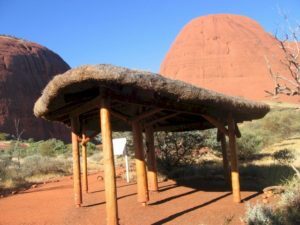 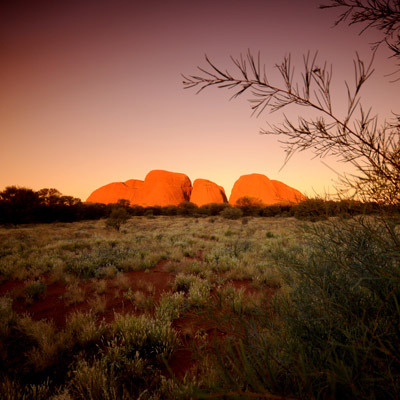 Known as Kata Tjuta to the local Aboriginals, ceremonies are often staged here by night. 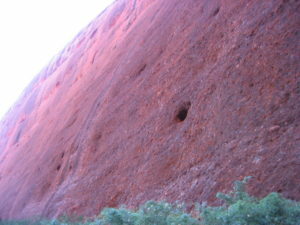 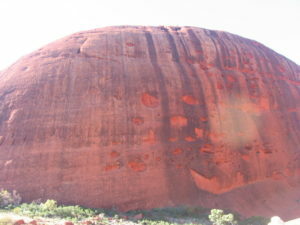 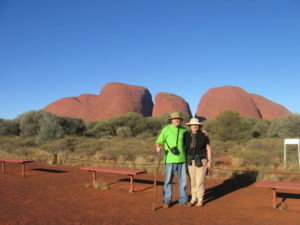 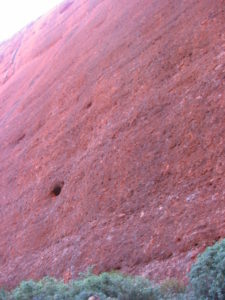 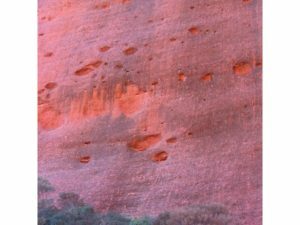 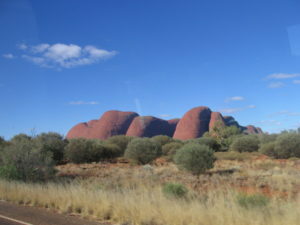 To get the best out of a trip, see Ayers Rock by sunrise, perhaps do the climb, and then carry on to The Olgas. 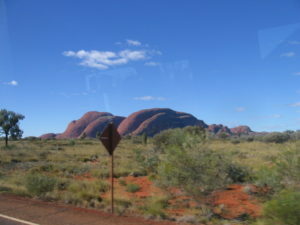 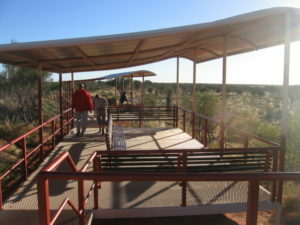 A stop off from the bus trip ….. on a viewing platform with the Olgas in the distance ….. 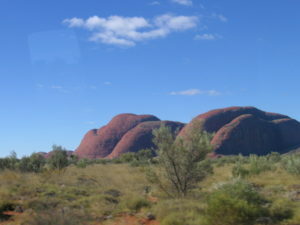 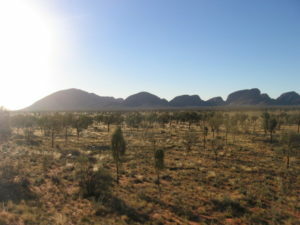 The Olgas coming into view ….. the hugh domes of rock becoming apparent in the photos below …..
One huge piece of rock …. 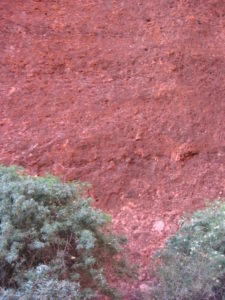 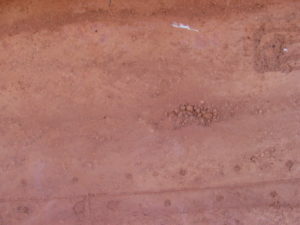 this rock is sandstone rock evidenced by the the layers of small pebbles and coarse sand. 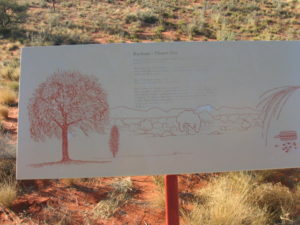 Read this post on this website: Biblical Creationism vs. Secular Creationism by Evolution and Chance ….Did this earth and the universe come into existence by blind chance or by Intelligent Design? 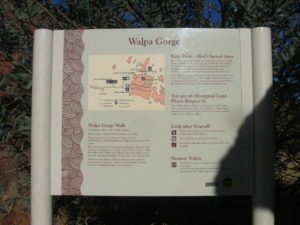 A sign on the Walpa Gorge walk, at 2.6kms, is one of the easiest and most popular of walks. 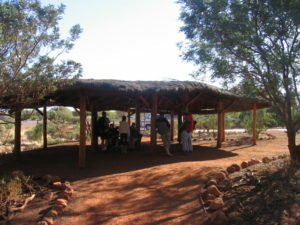 Shelter made from bush logs and a roof of native grasses and in wire netting. 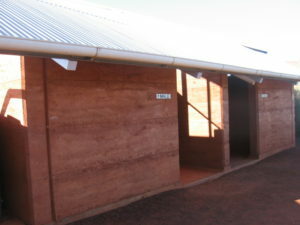 The toilet block is constructed from rammed earth …..